which may be used to guide this experience as a visualization. 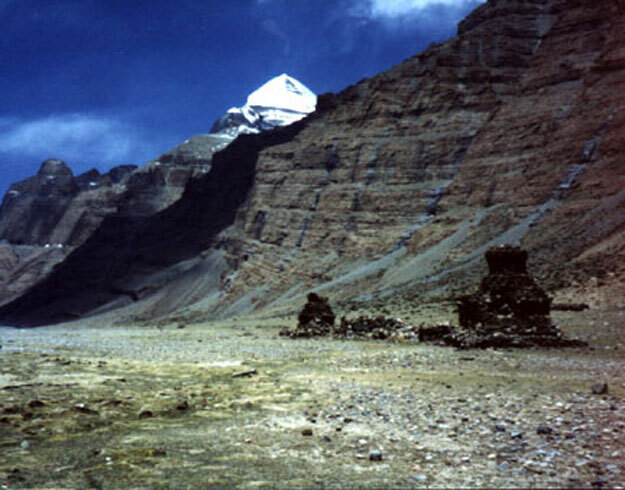 There is a valley, lying at a rather high altitude in the foothills of the Himalayan-Tibet ranges. It is surrounded by high mountains on all sides except towards the northeast, where there is a narrow opening in the mountain ranges. The valley is bottle-shaped in contour, with the neck of the bottle to the northeast, and it widens very considerably towards the south. Up towards the northern end, close to the neck of the bottle, there a huge flat rock. There are no trees or shrubs in the valley, which is covered with a kind of coarse grass. In front of the rock, looking towards the northeast, stand Those Beings Who are called by Their disciples The Three Great Lords. These are The Christ, Who stands in the center; the Lord of living forms, The Manu, Who stands at His right; and The Lord of Civilization, who stands to His left. These three face the rock upon which rests a great crystal bowl, full of water. The expectancy in the waiting, onlooking crowd becomes very great, and the tension is real and increasing. 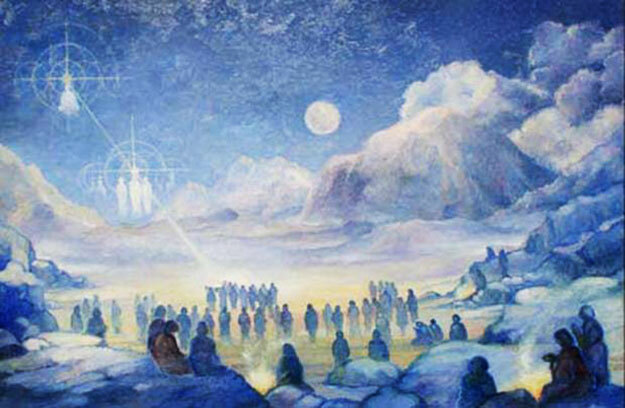 Through the entire body of people there seems to be felt a stimulation or potent vibration which has the effect of awakening the souls of those present, fusing and blending the group into one united whole, and lifting all into a great act of spiritual demand, readiness, and expectancy. It is the climax of the world's aspiration focussed in this waiting group. These three words ~ demand, readiness and expectancy ~ best describe the atmosphere surrounding those present in this secret valley. When The Buddha arrives at a point exactly over the great rock, hovering there in the air over the heads of The Three Great Lords, a great mantram, used only once a year, at The Festival, is intoned by The Christ, and the entire group of people in the valley fall upon their faces. This Invocation sets up a great vibration or thought current which is of such potency that it reaches up from the group of aspirants, disciples and initiates who employ it, to the Being we know as God. It marks the supreme moment of intensive spiritual effort throughout the entire year, and the spiritual vitalization of humanity and the spiritual effects last throughout the succeeding months. The Buddha's annual sacrifice for humanity (for He comes back only at great cost) is over, and He returns again to that high place where He works and waits. Year after year He comes back in blessing; year after year, He and His great brother, The Christ, work in the closest cooperation for the spiritual benefit of humanity. In these two great Sons of God have been focussed two aspects of divine life, and They act together as Custodians of the highest type of spiritual force to which our humanity can respond. 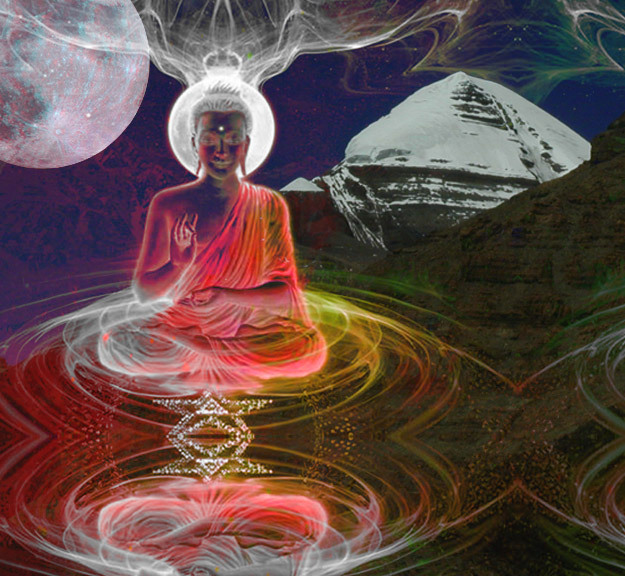 Through The Buddha, the wisdom of God is poured forth. Through The Christ, the love of God is manifested in humanity, and it is this wisdom and love which pour forth upon humanity each Wesak full moon. - From "The Wesak Festival~A Technique of Spiritual Contact"
to use as a meditation guide for participating in the Wesak Festival.